51. Queen Elizabeths two -hidden Sapphire tiaras. 60. Princess Marys Diamond scroll and cluster circlet. The Queen wearing the Oriental-Circlet-Tiara with rubies and diamonds , in Valetta, Malta, first time! 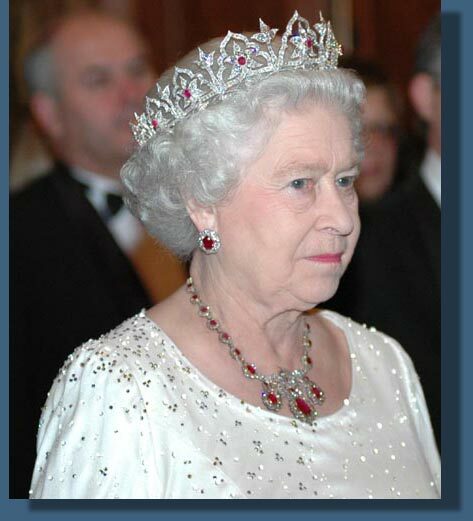 This also called Indian-Ruby-Tiara was one of the favourite headjewels of the late Queen Elizabeth the Queen Mother. PLEASE DO NOT COPY ANY PHOTOS FROM MY SITES FOR USE IN OTHER WEBSITES - Set a link! !